Christmas in Ukraine is celebrated on the 7th January is because, like many countries where the main Church is the Orthodox Church, they use the old 'Julian' calendar for their church festivals. In Ukrainian Happy/Merry Christmas is 'Веселого Різдва' Veseloho Rizdva (Merry Christmas) or 'Христос Рождається' Khrystos Rozhdayetsia (Christ is Born). Happy/Merry Christmas in lots more languages. The main Christmas meal, called 'Sviata Vecheria' (or Holy Supper) is eaten on Christmas Eve (6th January). Traditionally people fast (don't eat anything) all day but you might start the day drinking some holy water that has been blessed at church. You can't start eating the meal until the first star is seen in the sky. So people (especially the hungry ones!) go outside as soon as it start getting dark in the afternoon to try and spot the first star. The star represents the journey of the Wise Men to find Jesus and that Jesus has been born, so Christmas can start! The meal normally has 12 dishes which represent Jesus's 12 disciples. Traditionally the dishes don't have any meat, eggs or milk in them. The main dish is often 'kutia' a type of a kind of sweet porridge made of wheat. Other dishes can include mushrooms, sauerkraut, red ‘borsch’ (beet soup), dumplings known as 'varenyky' (Pierogi), 'holopchi' (cabbage rolls, make without meat in them at Christmas! ), 'pyrizhky' (cabbage buns), whitefish and 'kolach' (special Christmas bread). The room where Sviata Vecheria is eaten normally has a Didukh decoration placed in it. The Didukh is a made from a sheaf of wheat and symbolises the large wheat fields in Ukraine. It literally means 'grandfather spirit' and can represent people's ancestors being with them in their memories. Sometimes people use some heads of wheat in a vase rather than a whole sheaf of wheat. After the meal, people love to sing carols or 'Koliadky'. They can be sung around the table or you might go out caroling in the streets. People sometimes carry brightly colored stars on poles when they go caroling singing. The Ukrainian carol 'Shchedryk' is where the popular 'Carol of the Bells' came from. St Nicholas (known as Svyatyi Mykolai) visits children in Ukraine on December 19th which is also when Ukraine celebrates St Nicholas's Day. Making paper snowflakes to put on the tree or in windows are a popular decoration. 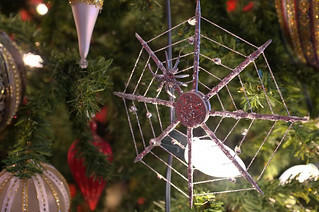 In parts of western Ukraine, Christmas Trees are often decorated with artificial spider's webs because of the story of The Christmas Spider. These are called made of paper and silver wire, called 'pavuchky' (which means 'little spider').